The Embliam empire seeks to subject all worlds to their control. In their way stands a nation of order: The Askran Kingdom. 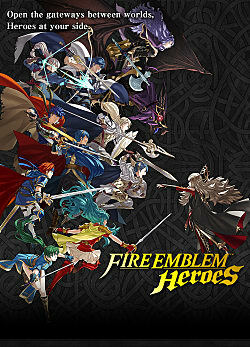 In this unique fire emblem title, you, the player, are a summoner for the Askran kingdom, possessing the ability to call upon legendary Heroes from different Fire Emblem worlds. Your task is to join the Order of Heroes and protect the Kingdom of Askr, and in the process all worlds, from destruction by the hands of the Emblians. Gameplay features four major aspects: Story Maps, Training Tower, Arena Duels, and Hero Battles. On the Story Maps, play through the new story featuring characters both new and old as you fight to save the Kingdom of Askr and all worlds. In the Training Tower, play through a variety of levels of varying difficulty to earn rewards and experience points for your units. Each time these maps are played, the terrain and enemies change to keep the experience unique. For Arena Duels, you will be put up against other users in a player vs player scenario. Rank up by playing, and earn greater rewards the higher your rank. Lastly, you can recruit limited time heroes by defeating them in limited-time battle scenarios in Hero Battles. Nintendo recently announced Fire Emblem Heroes' one-year anniversary updates and events. From hero banners to special maps, read on to learn more. We have all the info on the new Fire Emblem Heroes 2.0.0 update now out. Nintendo's new Fire Emblem Heroes update includes new characters, new quests, and a new option: Weapon Refinery. Desparate for some addicting games to help pass the time on Thanksgiving day? Here're a few suggestions for iOS users that just might do the trick. Xander can counter at range; you want this unit. That's why I am here to help you figure out how to beat him. The Grand Hero Battles give some great units. That's why it's awesome to have a second chance at getting Navarre. But beating him is tricky. Here is an F2P friendly guide to help you along. The Grand Hero Battles give some great units. That's why it's awesome to have a second chance at getting Robin. But beating her is tricky. Here is an F2P friendly guide to help you along. Previous Grand Hero Battles are back. Whether you missed these characters or aced both missions, this event is still worth your time. The Grand Hero Battles give some great units & Zephiel is probably the best yet. But beating them is tricky. Here is an F2P friendly guide to help you along. Gameskinny's definitive Fire Emblem Heroes Non-Inheritance List. Find out who the best characters are and what makes them so good (or bad). In this guide, you'll understand what Alm's Windsweep does, how to use it, what teams help complement Alm, and who should inherit Windsweep. I take a dive into Fire Emblem Heroes staying power. Can the devs keep pace for the foreseeable future? Do you enjoy Fire Emblem Heroes, but just feel there are not enough bunny costumes? Want more Easter content? Then this update is for you! These Genealogy of the Holy War characters are now available as new heroes to draw! Loads of changes and a pack of new characters have arrived in this FE mobile game's first major update! Nintendo's second mobile game strips the series down to its core and delivers a bite-sized experience that evokes the classic JRPG grind, but is still rewarding. No one has reviewed Fire Emblem Heroes yet! Played Fire Emblem Heroes yet? What did you think?